Owing to the enormous growth of VoIP applications, an effective means of identifying VoIP is now essential for managing a number of network traffic issues, such as reserving bandwidth for VoIP traffic, assigning high priority for VoIP flows, or blocking VoIP calls to certain destinations. Because the protocols, port numbers, and codecs used by VoIP services are shifting toward proprietary, encrypted, and dynamic methods, traditional VoIP identification approaches, including port- and payload-based schemes, are now less effective. Developing a traffic identification scheme that can work for general VoIP flows is therefore of paramount importance. 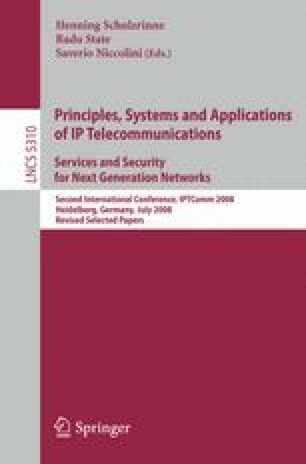 In this paper, we propose a VoIP flow identification scheme based on the unique interaction pattern of human conversations. Our scheme is particularly useful for two reasons: 1) flow detection relies on human conversations rather than packet timing; thus, it is resistant to network variability; and 2) detection is based on a short sequence of voice activities rather than the whole packet stream. Hence, the scheme can operate as a traffic management module to provide QoS guarantees or block VoIP calls in real time. The performance evaluation, which is based on extensive real-life traffic traces, shows that the proposed method achieves an identification accuracy of 95% in the first 4 seconds of the detection period and 97% in 11 seconds. This work was supported in part by Taiwan Information Security Center (TWISC), National Science Council of the Republic of China under the grants NSC 96-2219-E-001-001, NSC 96-2219-E-011-008, and NSC 96-2628-E-001-027-MY3.